At the beginning of his book The Great Stagnation, Tyler Cowen presents a single chart that provides the central evidence for slowing growth in the standard of living for individuals and families that he will explore in the remaining pages. That chart (below) shows where median family income would have been had we continued to see income growth roughly track per capita GDP growth. 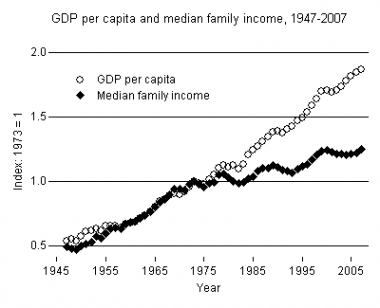 That chart of extrapolated income derives from the chart below produced by Lane Kenworthy showing median family income and per capita GDP series as indices. I've long wondered what median income would look like after taxes were taken into account and if the structure of Lane's chart might change given the dynamic nature of tax policy. Bruce Bartlett's recent post on average tax rates for four-person families pointed out the data I needed to make such a comparison. The Tax Policy Center produces annual average tax rates for four-person families at the median income level. 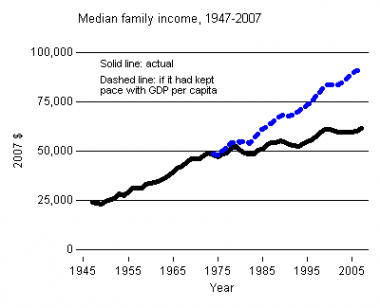 Using their historical data I can back out the growth of after-tax median family income since 1980 (just after GDP per capita and median family income start to diverge) and add that data to the chart that Lane produced. The results, though not earth shattering, are interesting. Prior to 2000, both real (i.e. 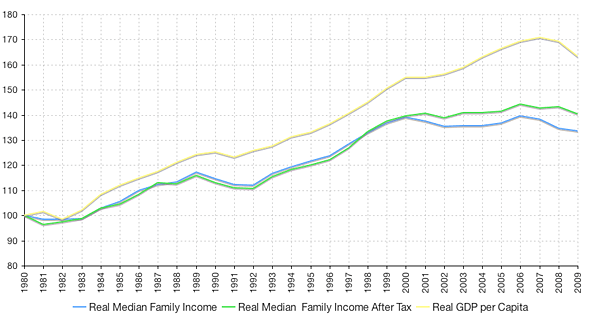 inflation adjusted) median family income and real median family income after taxes grew at about the same rate. Real median family income has actually declined since 2000, but when you look at after-tax dollars received by households it's been relatively flat. In other words, the median family has been able to avoid a more substantial decline in income by paying somewhat less in taxes. It's not a huge difference, but treading water certainly feels better than sinking. And part of me wonders if this phenomenon doesn't play some small role in the toxic policy debate surrounding taxes. If tax rates on the median family rise now, it's likely that the after-tax income of those families will fall from the plateau it has been riding along for the last decade. If real median income were growing, however, I suspect there would be at least somewhat less resistance for increasing tax rates as it would only slow growth in after-tax income as opposed to causing its outright decline.